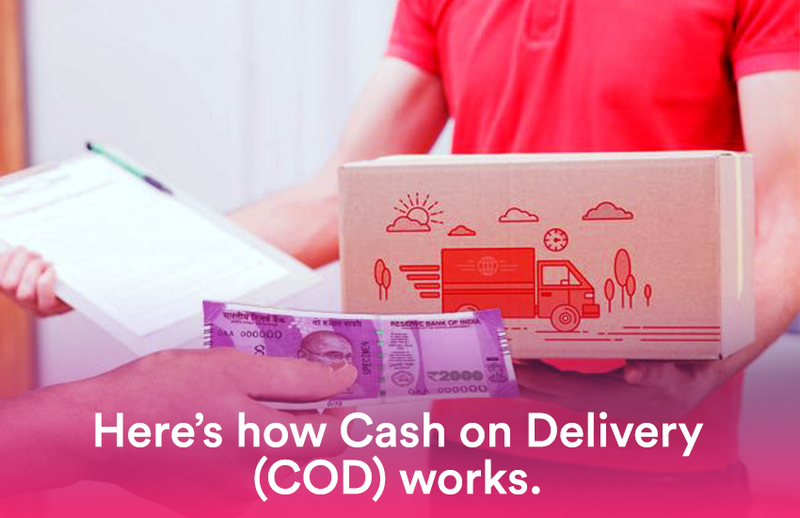 Share the post "Here’s how Cash on Delivery (COD) works." Cash on delivery (pay on delivery) is one of the prominent payment methods for online shopping in India. Your customers love to receive and see the product before paying for it and COD payment has made it possible. Cash on Delivery is a type of payment method where the recipient (the customer) make payment for the order at the time of delivery rather than in advance. If the buyer is not making payment at the time of delivery, the product returns to the seller without further obligations from the customer. Buyers place an order on website and requests delivery at the given address. The customer does not make payment while ordering the item and chooses pay on delivery as a payment method. Once the order is placed, an invoice is prepared by the seller which is attached to the parcel. A delivery boy picks the shipment from the seller or supplier and delivers it to the address provided by the customer. The customer makes the payment to the delivery boy in cash or card (as many companies accept card payment as well at the time of delivery). The COD amount is then deposited to the account of the logistics partner. The logistics company remits the amount to the seller/supplier’s account on time after deducting the handling charges. How does this affect you as a seller? Cash on delivery orders are not so very different from prepaid orders except the payment method. The seller does not bear loss since the amount that you receive for the product remains the same. At iThink Logistics, we provide you with multiple options for delivery partners where you need to select any of the suitable delivery partners, pack the item and the delivery executive will pick the product from you and ship it to the customer. Once the delivery is made, the customer makes a cash payment which will be credited to your account at a specified time. Generally, the shipping partner will make three attempts to deliver the package to the customer. If even after the third attempt, the delivery could not be made the package is then returned to the seller. Offering COD payment option may increase confidence in your customers for a new company which does not have a strong brand recognition yet. It also reduces debit/credit card fraud and buyer identity fraud. Why is COD popular in India? Cash on delivery option is boosting e-commerce in India. It is also popular among young customers who do not have credit cards and other means for paying for goods. Cash on Delivery is just another mode of payment you provide to your customers. As a seller, you have nothing to worry about regarding COD proceedings. In fact, COD drives more traffic to the website and gives your customers a sense of security. Sellers should use it to their advantage. Share your views on COD as a payment method for e-commerce stores. Next articleWhy your e-commerce business needs an NDR team?